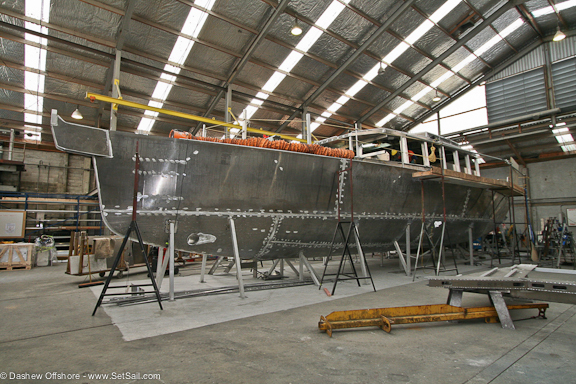 We have been behind in our reports on how the FPB 64 production is progressing. This batch of photos were taken during August and the first week of September. The lead photo is, in construction industry parlance, the “topping out” of FPB 64-5. 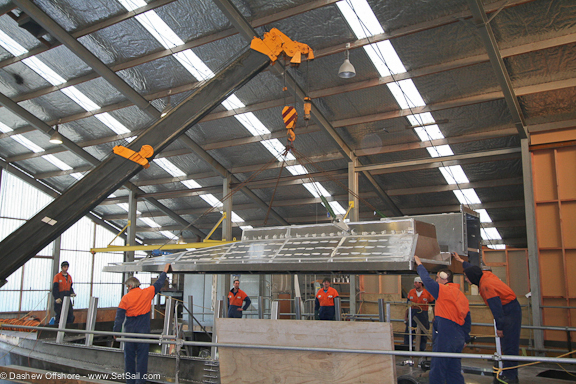 The jig built roof structure is being lowered over the window mullions. 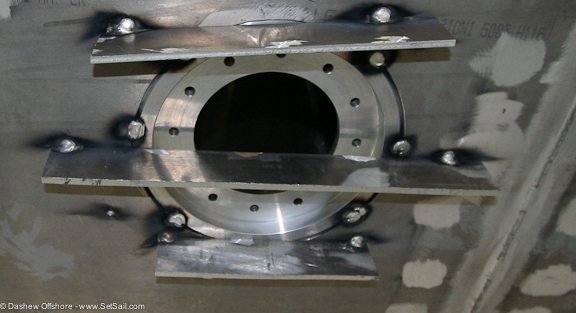 Very precise construction is required for these elements to fit together. Looking forward from the aft side of the house. The great room roof is heavily reinforced. 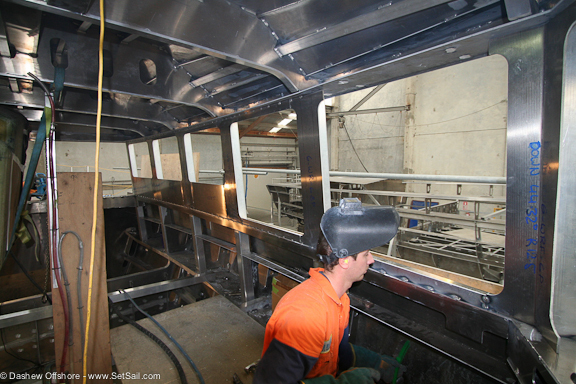 Note the transverse girders which tie to the mullions. All of this structure depends on the stiffness of the window mullions. 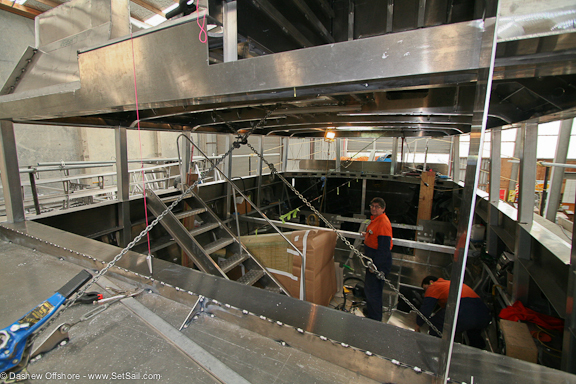 The mullions are connected at the top of the coamings (a box beam), at the deck, and to a heavy topside girder. 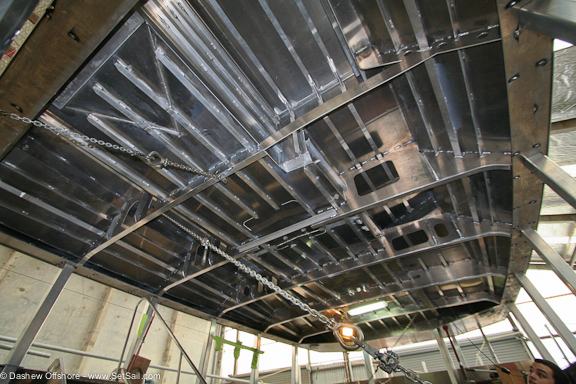 The “couple” between the topside girder and coaming top makes for a hugely stiff mullion connection. House roof structure welding now almost complete. 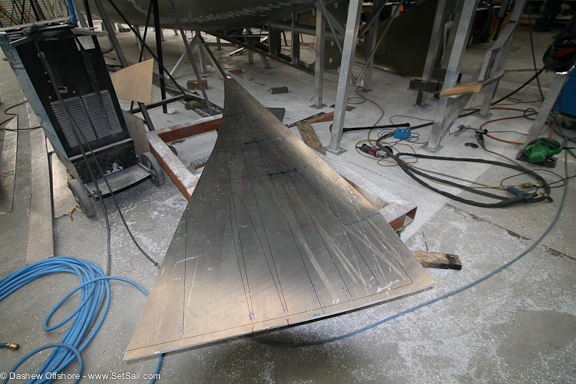 Jumping below the waterline, a few s keg details, starting with this very complex shape on a skeg plate section. 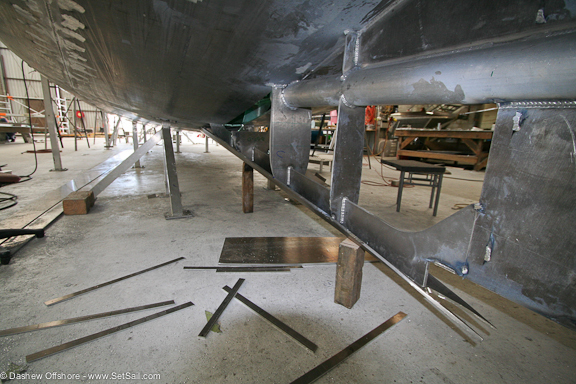 The skeg framing on FPB 64-6. Between the heavy framing and 12mm plate, this is designed for abuse. 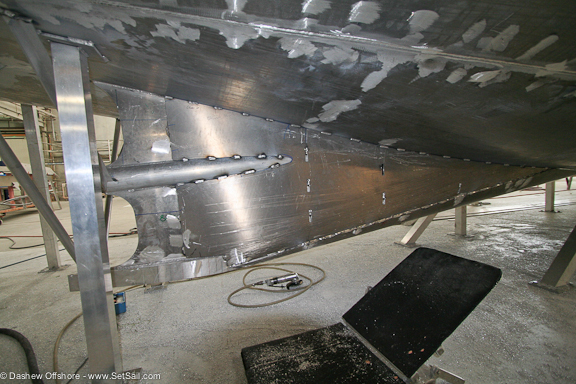 Note the massivee casting that is welded into and projects aft, beyond the prop tip, from the bottom of the skeg. Still on #6, a series on the bow reenforcement. 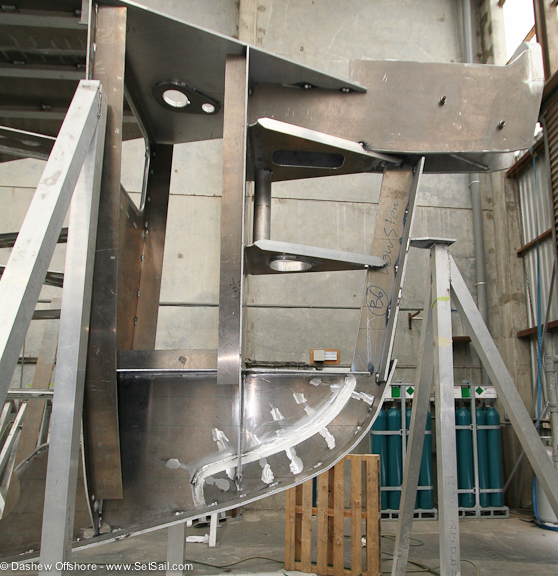 The stem bar (centerline girder) is stiffened with horizontal frames. 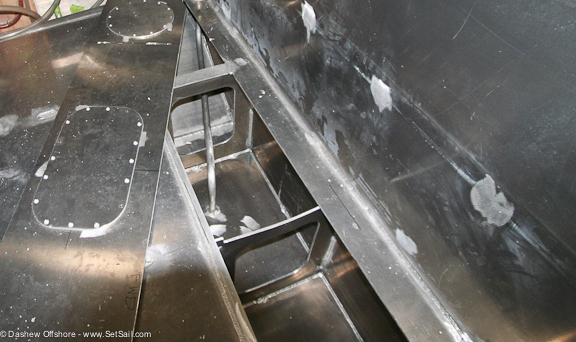 This area is sealed off with a collision bulkhead forming the forward bulkead of the chain locker. 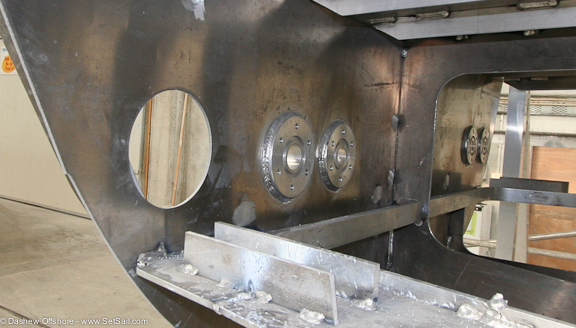 The round bar is the towing bit/Sampson post above deck, is solid, and welded at three horizontal locations. 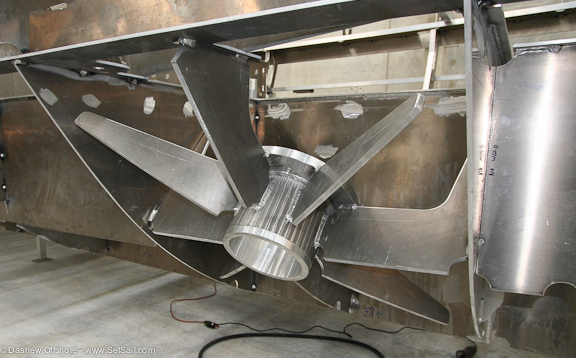 A nicely faired thruster pipe. 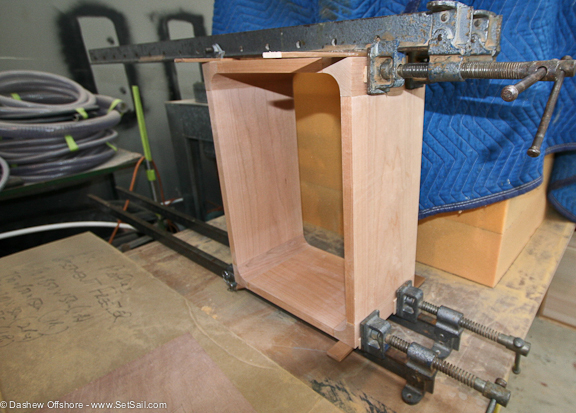 Strapping and notched frame (reinforced of course) for plumbing and wiring runs. Looking into a coffer dam, the separation between fuel and water tanks. 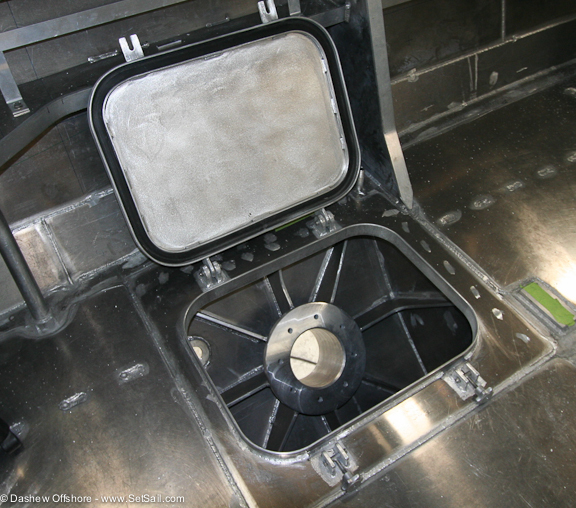 The lid with its access hatches is ready for welding in place. Preparation for transducers in the forepeak. 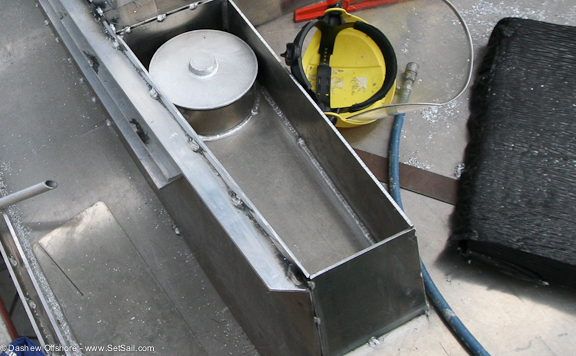 A Dorade box before the top is welded in place. 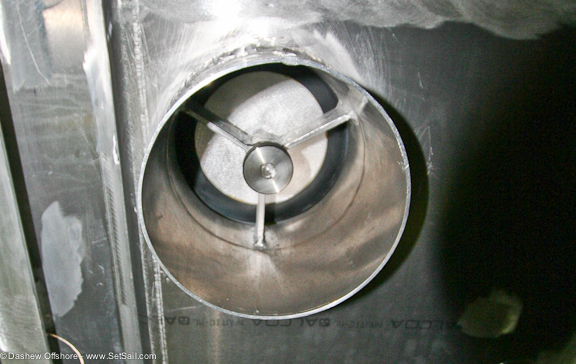 The down pipe with lid is at the top of the photo. Same pipe, from inside, looking up. 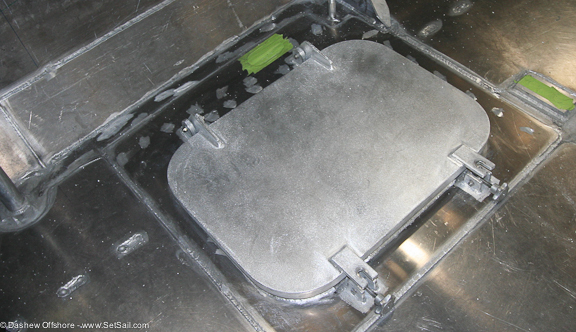 Note the gasket (black) to seal the lid. Same area, now with the 12mm (15/32″) hull plating in place. All of which resides in a watertight coffer dam. The lid of which is here closed. The aft end of the great room . 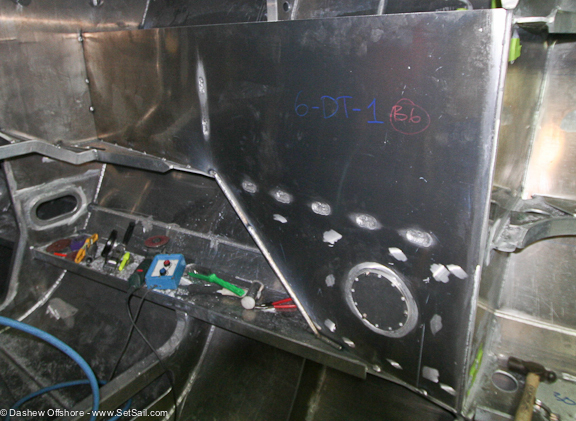 Note the penetration at the top for mast wiring, of which there is a lot! This opens into a locker under the stairs (new in the second series of FPB64s) which keeps it dry. 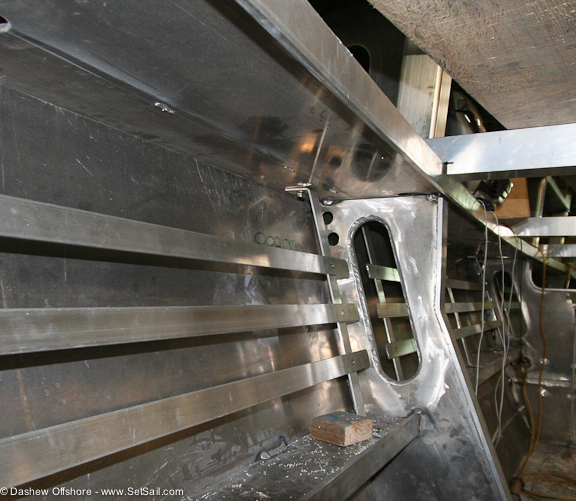 Inside of transom on #6. Hard spots are for various exhausts. 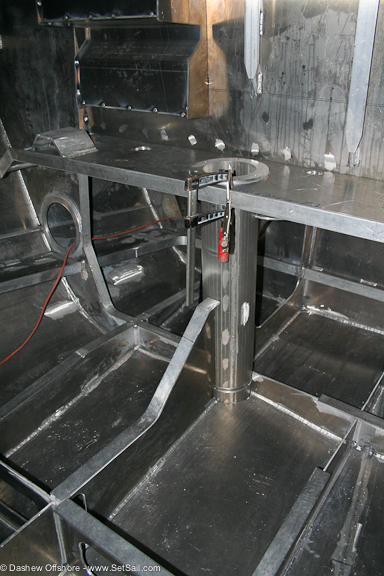 Aft end engine room, showing centerline reinforcement, which terminates at the rudder post. 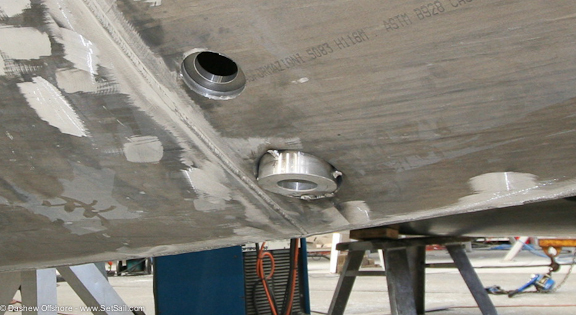 The top of the rudder shaft pipe is well above the waterline, so no packing gland is required and there are never any leaks. 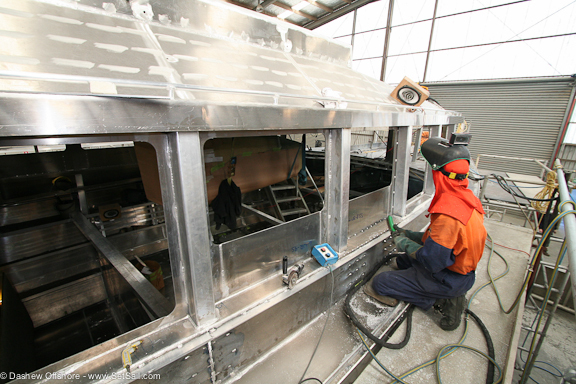 A day tank in the engine room. And finally, the cabinet work for FPB 64 -7 has started. 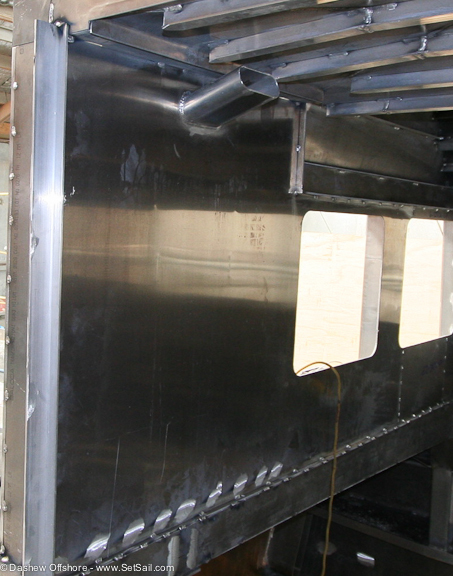 This is a hatch coaming. This entry was posted on Thursday, September 8th, 2011 at 9:11 am and is filed under FPB 64 Updates. Both comments and pings are currently closed. Now that’s how to build a boat! Thank you for sharing. It proves to me once again that you have mastery of your trade. It comes from learning lessons the hard way. Steve, FPB64 #7 is your best looking boat so far!! Wow!! 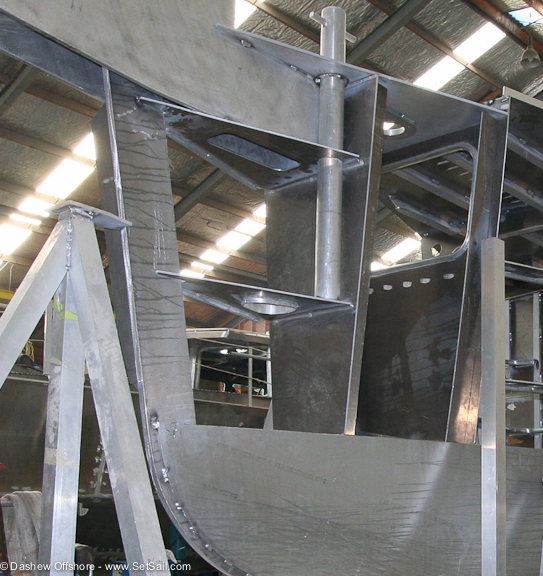 I agree, very cool looking coaming! Steve – have you considered the gyro type stabilizers? such as seakeeper? 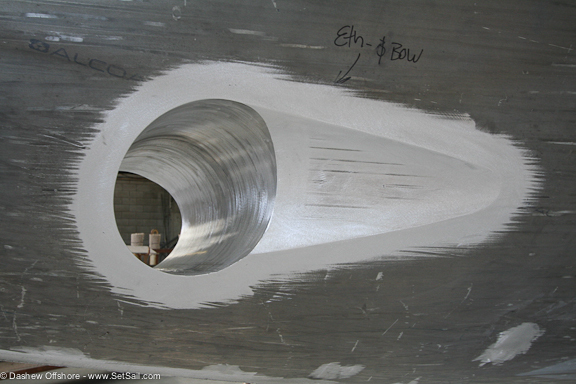 may decrease construction costs and decrease drag, no external stablizers. We have discussed gyros before. For our type of use at present they are not well suited.